RECIPE: QUICK WATERMELON SHORTBREAD COOKIE CRUMBLE - What About Watermelon? I don’t know about you, but I enjoy spending more time eating my meals than I do preparing them. Knowing that something delicious is going to be prepared in a half hour or 45 minutes makes me feel like a kid in line at the candy store. I’ve found that the best recipes are the shortest and simplest because I don’t have to wait as long to try my concoction. This recipe for Quick Watermelon Shortbread Cookie Crumble is probably the easiest recipe we’ve ever featured on the blog. With just two ingredients, this no-bake dish is great for when you need something quick, easy and delicious! Historically, two-ingredient items have been pretty successful: peanut butter and jelly, ice cream and sprinkles, bacon and just about anything. So, give this one a whirl … it could be the next big thing! Place half of the crumbled cookies on the bottom of a deep 9” x 13” dish and flatten into an even layer. Spoon the watermelon over that in an even layer. Sprinkle the remaining cookies over the top. Serve with sweetened whipped cream. 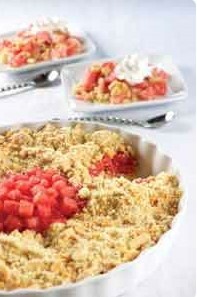 For more recipes using watermelon, check out the “Recipes” sectionof the National Watermelon Promotion Board website.